Boeuf bourguignon, ratatouille, coq au vin…these traditional French foods may seem intimidating to the home cook thinking they can only sample the warming flavours in Parisian bistros, but the truth is they’re simply just big ol’ slow-cooked one-pot-wonder stews! 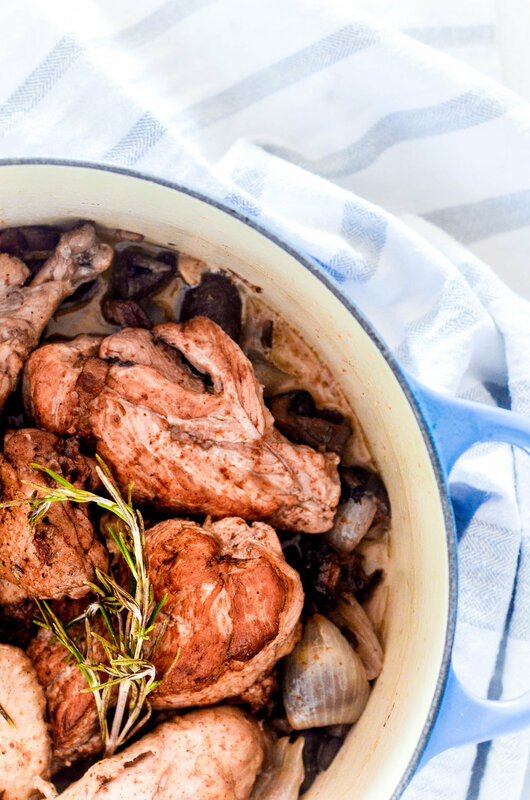 Seriously you guys, it doesn’t get easier…and tastier…than the above, and today we’re exploring one of my faves, coq au vin. As you’ve seen in my Simple Roast Chicken with Lemon & Herbs (Plus Carving Tips) post, I love using the whole bird. It minimizes waste, maximizes nutrient density, and helps us become more understanding and appreciative of the foods we eat and where they come from. Now of course, you can simply buy the chicken parts, but where’s the fun in that? Actually, zero judgment or guilt whatsoever if that feels more accessible to you. It’s all about making nourishing food accessible and friendly, and nothing is more accessible, friendly, and FOOLPROOF than the recipe below. As always, don’t feel you like you have to follow it to-a-t. Sub the butter for coconut oil or more olive oil, sub onions for shallots, swap the thyme for another fresh herb of choice. Don’t have access to fresh herbs? Use some dried ones! 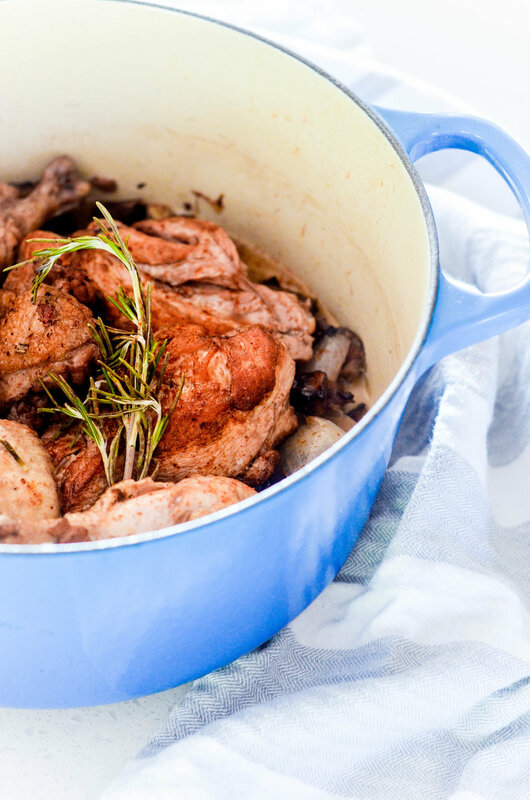 Just please don’t take it too seriously and remember coq au vin, boeuf bourguignon, ratatouille – these were all foods designed to fill bellies, nourish the soul, and use up bits and bobs in the pantry and cupboards. Now that’s my kind of cooking! In a large pot (I use Le Creuset’s 25cm French Round Dutch Oven), sauté the bacon until cooked through and set aside leaving the fat still in the pot. Brown the mushrooms, onion, and garlic slightly in the bacon fat and set aside. Recoat the bottom of the pot with the butter and olive oil, and then brown the chicken pieces before adding back in the bacon, mushrooms, onion, and garlic. Top with the red wine, bone broth, thyme, bay leaves, a generous sprinkling of sea salt and black pepper, and allow it to simmer together for a few minutes. Cover the pot with a tight fitting lid, and place the pot in the preheated oven, cooking for about 30 minutes until the chicken is cooked through but still tender and moist. Remove from the oven and serve as is, or in a separate bowl whisk together a bit more melted butter with some tapioca flour, stir that into the stew, and allow everything to simmer for a few more minutes to thicken up the sauce.